Old kitchen sink faucet is for two holes wall mounted installation, has two vintage cross handles for cold and hot water, used good quality copper casting and advanced electroplated finish. 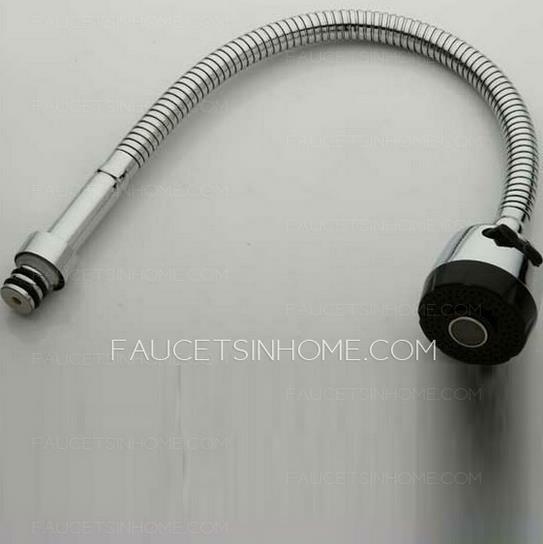 Full rotatable faucet pipe is convenient,made of stainless steel, can be bent, spout can open to clean and has two types water of ordinary water and shower water. Q: What’ s the material of faucets? A: The most common material: iron carbon alloy, PVC material, zinc alloy, ceramics, brass and so on. Q: Could the basin not hold the water after pulling the sink faucet lever raised? A: The seat did not seal the water basin, inject the seat bottom ring putty or silicone. Q: What’s the matter of small amount of tap water or water bifurcation? A: There are too many impurities in the water so it impact the bubbler work. Please unscrew the bubbler with vinegar soaked and cleaned, then replace the faucet. Q: What’s the matter of the basin faucet and kitchen faucet with small amount of water or non-foaming? A: The water pressure is low, remove the faucet spout and change a bubbler. Q: How to deal with the leaking pull the hose and faucet? A: Improper installation or rubber ring deformation. Please replace the rubber ring and re-install. Q: How to deal with leading caged? Cause: ① not apply pressure range; ② battery power is exhausted. Corresponding solution: ① redesigned according to specifications table; ② new battery. Cause: ① filter dirty; ② not apply pressure range. Corresponding solution: ① clean the filter; ② redesigned according to specifications. Cause: dirty filters. Corresponding solution: clean the filter. A:All products on faucetsinhome are free shipping to United States. Some products are complicated, so we need to adjust for customer. Generally speaking, the delivery time is 5-15 days. For more information, please feel free to contact our customer service: 1(347) 688 7991. A:After you placed the order on faucetsinhome.com, our customer service will send you an email including the detailed information about your order like shipping address, and your item information. So if there is any problem or mistake you can contact us and we will correct for you. Also, when we shipped your order, we will send you the email with tracking number, so you can check online. We will keep your privacy and will not sell or reveal your information to others. A:faucetsinhome Quality Assurance Program is a vital part of our corporate policy and store operations and is fully supported by senior management. Our organization is committed to an effective product safety program that ensures that our stores and products meet established standards for safety, quality and value. faucetsinhome offers quality products that meet or exceed product requirements established by applicable government agencies and our Quality Assurance department. Suppliers and products are evaluated for compliance with company standards and regulatory requirements through vendor audits and product inspections on an ongoing basis. The Quality Assurance department investigates customer concerns and initiates the appropriate follow-up and response action. If you have any questions, or to send us a comment, email us. A:faucetsinhome proudly stands behind the products we sell. faucetsinhome One-Year Warranty states that we will repair or, at our option, replace at no charge, your purchase within one year of the purchase date should you discover any defect in materials or workmanship. This warranty does not cover defects, including breakage or malfunctions, caused by your mishandling or use of the product in ways other than specified by the manufacturer. 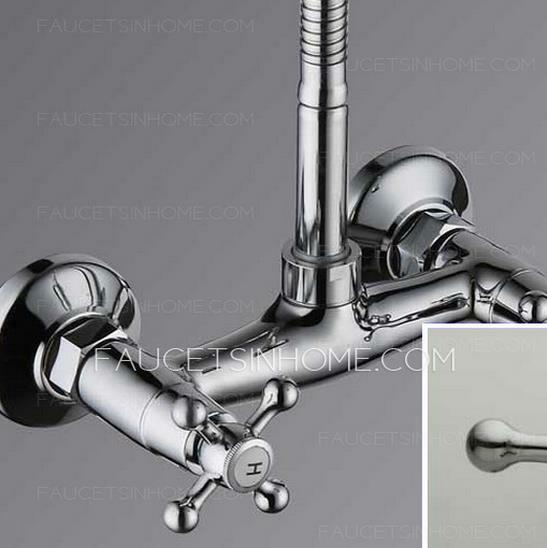 So lucky to buy this faucet in cheap price because it is really nice for me. Very nice faucet. I ordered 2 of these to have throughout my kitchen and aren't disappointed with any of them. I have used it for over one year,it woeks well and I plan to buy one again. The reviews are correct and the product is in good quality. I do not know how to describe it but it is worth buying. It is really a bargain. This vintage electroplated kitchen sink faucet decorates your kitchen general and modern. It has two holes for wall mounted installation which help you save your room. Electroplated kitchen sink faucet USD$59.99, save 69%off. This kind of kitchen sink faucet is made in brass which is durable and high-quality. It has advances multilayer electroplated surface which is anti-corrosion and wear-resisting. 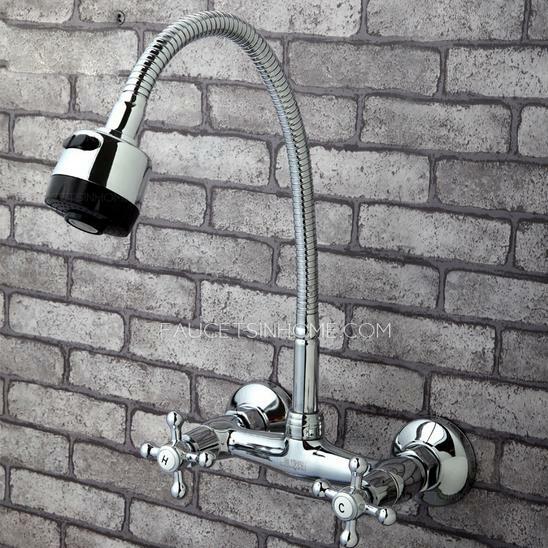 The pipe of the faucet is made in stainless steel which is durable and lasting as new. It can be rotated for 360°and bent in any directions. The body of this faucet is made in all brass. It has two cross handles for you to control cold and hot water. Each handle has a cold/hot water mark for you to recognize. The material of the spool is ceramic, it has good ability of anti water pressure. The water hole has two modes in spray and water column. There is a switch for you to change the modes. The water hole also has a filter screen which can help filter the impurities. What’s more, the head of the water hole can be disassembled and washed in case of the impurities block the pipe if you use it for a long time. I'm trying to find in your site and adapter for a two handle wall mount faucet I found on your site from adapter from a 6" center to 8" center Thank you . Upon opening it we immediately realized that the span between the faucet handles is to short. It measures 6 inches. Our free standing stainless steel sink has 2 holes that span 8 inches.Since this faucet is a wall mount/free standing sink mount we are not able to make it work. In general, for 2 holes or above, standard distance of 2 pipe center should be 150mm, and had better at the same horizontal line. But there has the way to solve problem ,You need buy the adapter.If the distance is above or under 150mm, pls purchase the faucet adapter to adjust.